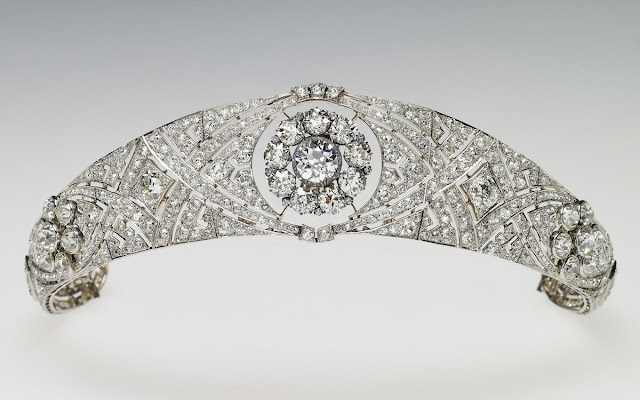 Queen Mary's Diamond Bandeau Tiara was commissioned by Queen Mary in 1932 and was designed to feature the detachable brooch at its center, an 1893 wedding present to Mary from the County of Lincoln. The tiara was bequeathed to The Queen in 1953. It had to wait until 2018 for its next appearance, when The Queen loaned it to Meghan Markle for her wedding to Prince Harry. Read about the tiara's full story here, at Order of Splendor.